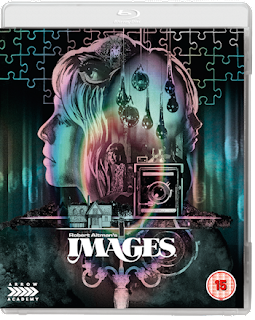 Realm of Horror - News and Blog: Robert Altman's IMAGES arrives on UK Blu-ray 19th March. Robert Altman's IMAGES arrives on UK Blu-ray 19th March. One of Robert Altman’s greatest masterpieces, Images is a tour de force of psychological horror. Dealing with hallucinations and apparitions, the film deftly blends reality with nightmare as Susannah York’s children’s author is terrorised by visions of mayhem and murder. On its release, Images reaped accolades although it has now become one of Altman’s lesser known works, so this Arrow Academy release marks the perfect time to rediscover it. The early seventies were a period of remarkable activity for Robert Altman, producing masterpiece after masterpiece. At the time he came to make Images, MASH and McCabe & Mrs. Miller were behind him, with The Long Goodbye, California Split and Nashville still to come. Originally conceived in the mid-sixties, Images concerns a pregnant children’s author (Susannah York, who won the Best Actress award at the Cannes Film Festival) whose husband (Rene Auberjonois) may or may not be having an affair. While holidaying in Ireland, her mental state becomes increasingly unstable resulting in paranoia, hallucinations and visions of a doppelgänger. An examination of a mental breakdown, an exploration of the creative process or a deconstruction of narrative film. However you choose to read Images, it’s undeniable that it is one of Robert Altman’s best works. Altman’s script and direction match perfectly with Vilmos Zsigmond’s dream-like cinematography, an early haunting score by John Williams, and Susannah York’s unparalleled performance to create a disturbing, nightmarish psychological horror film. Once thought lost after it was rumoured that the original negatives were burned by Columbia Pictures, Images is here given the release it deserves, with a brand new 4K restoration from the original - distinctly not burned - negative making the most of that stunning cinematography. The Blu-ray is also packed with special features to keep even the most ardent cinephile happy. A commentary and interview recorded prior to Altman’s death in 2006 are joined by brand new features such as an interview with actor Cathryn Harrison to make this a must-have for Altman devotees.